You're probably not watching USA's Suits. Not because it's not an entertaining, smart show—but do you really have time for another legal drama in your life, and one on USA at that? I began watching Suits when it debuted in 2011 because I watch a lot of television and I'll give almost anything a chance. I stayed for the sharp dialogue, fairly unique premise and Jessica Pearson. Suits stars Gabriel Macht as Harvey Specter and Patrick J. Adams as Mike Ross—lawyers at a high-powered New York law firm. Mike Ross begins the series as a bike messenger with a photographic memory who lied his way into a position with Harvey Spector. Initially, Harvey and everyone else at the firm is under the impression that Mike graduated from Harvard Law School and passed the New York bar exam. Neither is true and his illegal practice of law is, as you can imagine, a major source of drama throughout the series. The beginning of first episode had my casual interest—it was clever and seemed to know what it was doing. Then we met Jessica Pearson, a managing parter at the firm played by Gina Torres. We're lucky to be in a time when women are actually getting quality roles on television. With this influx, I hope to see us abandon the urge to refer to any capable, interesting, nuanced woman on television as "a strong female character." In Torres' case, I'm sure more than one television critic has felt the urge to paint her with the "strong black woman" brush. When we discuss so-called strong female characters on television, all we really mean is that they're real women who display a multitude of feelings, insights and reactions. Part of the reason Shonda Rhimes has been so successful is because she is able to create female characters that feel like real people and in doing so, challenges and expands the representation of womanhood on television. Olivia Pope is smart and strong, of course, but she also has terrible taste in men. Cristina Yang is a brilliant surgeon who at one point gets an abortion not because she was raped or because of a health problem—but because she simply did not want to have a child. Even beyond Shondaland, women like the The Good Wife's Alicia Florrick confirm the fact that interesting, complex women make for great television. Jessica Pearson is smart. But that shouldn't be surprising—of course she's smart—she's a powerful New York attorney. She's the boss. The joy I derive from her intellect is in the fact that she's smarter than everyone else around her, as she very well should be. She's smarter than all the cocky white dudes under her employment and she doesn't let them forget it. As a leader, Jessica has found a way to be both loved and feared—cultivating obedience and extreme loyalty. She is a career-driven woman who expresses little to no regret about her decisions. We learn that she used to be married and maintains a friendly relationship with her ex-husband. Yes, a woman who manages not to be bitter over a man. The novelty. I love that we don't see her torn between picking her kids up from school and handling a crisis for a big client. There aren't any longing gazes at small children as we see the soft sadness in Jessica's eyes, lamenting over her decision not to have children. Because that is not every woman's dream and, most importantly, that is not this woman's dream. 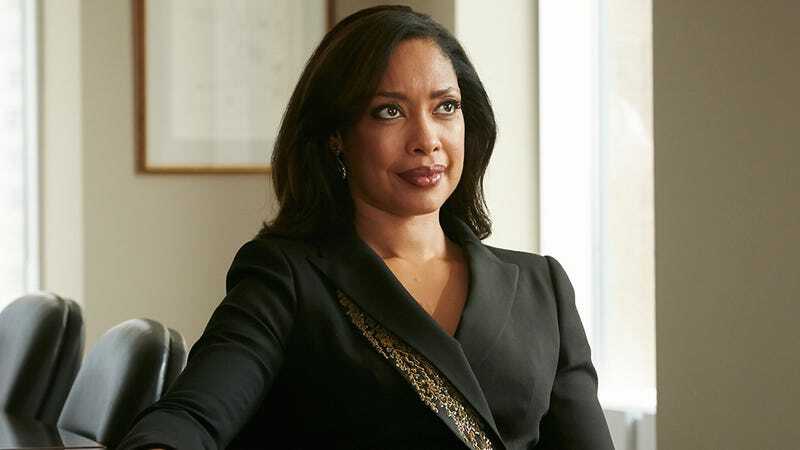 In real life, Gina Torres identifies as an Afro-Latina. Her race isn't ignored, but is brought up exactly as often and in the ways that you would expect. As a lawyer, Jessica Pearson shows an almost clinical perspective on race—largely concerned with how it can or cannot hurt or help her clients. Still, she is quick to call out hypocrisy or a lack of acknowledgment of race from her mostly white staff. And then there's the superficial. Gina Torres is obviously gorgeous and her character seems so in command and aware of her beauty. She doesn't use her sexuality to win cases, but she certainly lets you know, that she knows, you couldn't stop staring as she walked away. There's a running sexual tension between Jessica and Harvey, with the joke being that Harvey is clearly attracted to her, but that ain't ever going to happen. It's important to acknowledge and celebrate characters like Jessica Pearson. For every female character with her depth and smart storytelling, there are five Walter Whites or Tony Sopranos. She serves as encouragement and a reminder this is possible for women on television to be just as interesting, if not moreso, than men they share the screen with. Not only that, we already have these women on our televisions right now—we have Jessica Pearson—and we shouldn't have to accept anything less. The fourth season of Suits premieres tonight.